2018 Cobra CX50 FWE. Picture credits - Cobra. Submit more pictures. 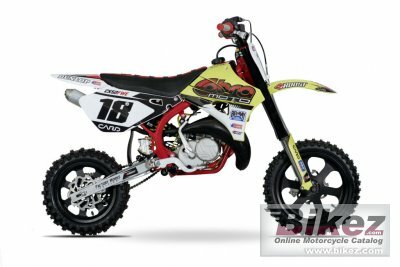 Cobra set the mini motocross world on fire in 2016 with the introduction of its Factory Works Edition King 50. The FWE win record is staggering, and in 2018 we�re stepping it up once again with improvements to the engine, suspension, and brakes. The scoreboard is clear, if you want to be a winner at the world�s biggest events, make sure you�re riding a Cobra FWE. Price as new (MSRP): US$ 5198. Prices depend on country, taxes, accessories, etc. Engine details: Cobra FWE Venom engine. V-Force Reed Valve. Wheels: Mag wheels. Dunlop Geomax MX3S tyres. Ask questions Join the 18 Cobra CX50 FWE discussion group or the general Cobra discussion group. Bikez has discussion forums for every moped. View comments, questions and answers at the 2018 Cobra CX50 FWE discussion group. You can sign up for e-mail notifications when other riders answer you. If you have extensive experience with the MC, please send us a review. If you consider buying this bike, you should view the list of related motorbikes Look at photos. Compare technical specs. And check out the rating of the moped's engine performance, reliability, repair costs, etc. You can compare the rating with other bikes.